Every player is likely to, some day, run out of resources to build troops, do research or construct buildings. Its incredibly annoying to have to wait for your farms and quarries to produce the needed resources, or to have to farm it for yourself. Luckily, one of the better features of being in an alliance is the ability to ask your alliance buddies for the needed resources, or better yet, the alliance bank. However, too many times, players -especially the new ones- ask for resources or help at the wrong place. So here are some simple, easy-to-follow rules on how to correctly ask for either resources or help…. Go to the alliance chat and press the big plus in the right hand corner (see picture above). Specify the amount you need and press ok. Most likely, there will be someone with that resource to spare willing to give it to you. Do not ask for resources through mail or the alliance wall page. This is incredibly annoying as it fills everyone’s in-boxes with garbage, and without coordinates, makes it even impossible to properly respond. The alliance wall isn’t really used for anything atm for all I know, but it also is definitely not the place to ask for help or resources. Do not ask for ridiculous amounts of resources. I’ve seen players ask for as much as 10m of a certain resource. These amounts are rarely just lying around, everybody else is also trying to build their city and army. Ask for reasonable amounts of resources, preferably just what you need. Do not rely on alliance members constantly. Asking alliance members for some help with a resource when you just ran out and really need is fine, but it is also each player’s own responsibility to gather the resources they need, either through field buildings or through farming other players. It is assumed rude to just not invest in resource gathering and keep asking alliance. 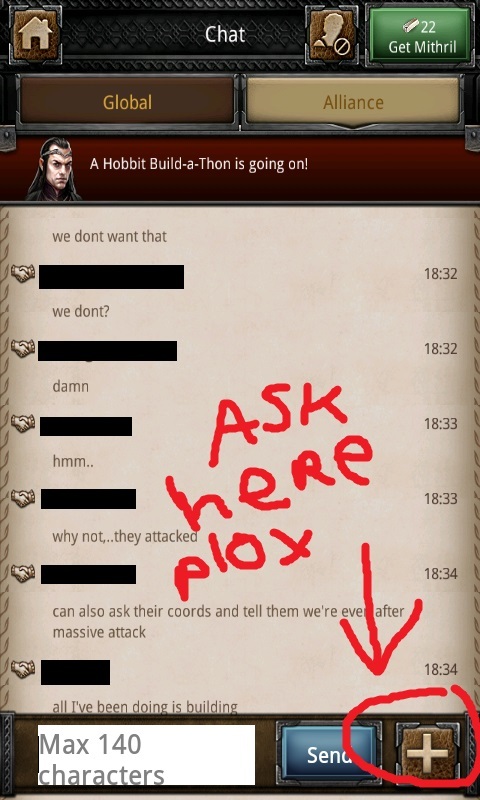 Ask for help in alliance chat. Just as with resources, AC really is the place to go to ask for help. Members are virtually guaranteed to be online throughout the day, else wait for them to come online. Specify everything you know. Don’t just say you were attacked by some guy. Post all you know: coordinates, troop numbers, alliance, scouting reports. Everything helps in coming to the correct response. Do not use mail or alliance wall page. Same reason as with resources, it is annoying. Try to leave the emails to the officers; they will let you know if something important is happening. IMO, regular members should try to stick to AC for questions. You were farmed once by some random player. Simply put, this happens to everyone. Do not value your gold, and protect your resources with a proper level vault. This is your own responsibility! No vault –> you’re begging to be farmed. ***Exceptions could be made for attacks on the chancy or the bank. However, I do not call the shots on this one. All in all, following these rules makes responding to threats much easier and streamlined, and keeps our in-boxes empty! Good luck friends! This entry was posted in Alliance, Articles and tagged Alliance, chat, farming, help, kingdoms of middle earth, mail, reinforcements, request, resources, revenge, troops, vault, wall by beardmonkey. Bookmark the permalink.